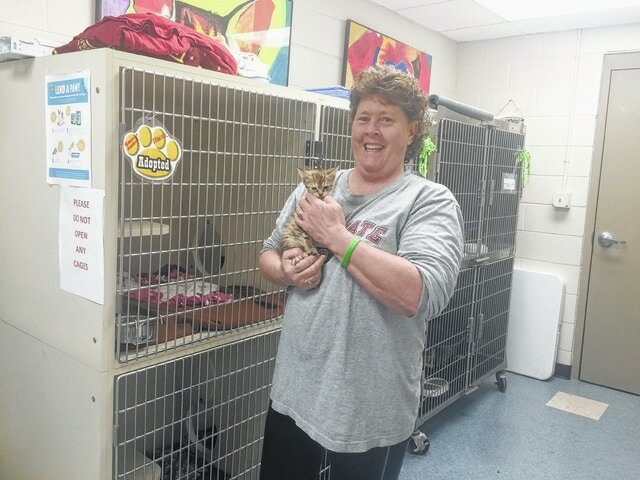 Dr. Gail Counts, veterinarian and owner of Shawnee Animal Clinic, and director of Sierra’s Haven Animal Shelter, holding an adoptive kitten at Sierra’s Haven. PORTSMOUTH — May is national pet month, and Dr. Gail Counts, veterinarian and owner of Shawnee Animal Clinic (SAC), and director Sierra’s Haven Animal Shelter (SHAS), suggests dog and cat owners render special attention towards having their pets spayed or neutered to help with an ever-increasing number of stray animals in Scioto County. Counts utilized her day off from SAC, located at 101 Bierly Road in Portsmouth, to go over to SHAS, 80 Easter Drive, also in Portsmouth to perform surgeries on adopted pets, something that helps with the over population of animals in the county. Counts said the experience of cats and dogs having puppies and kittens is perceived by some as an entertaining experience for their children, something that is not beneficial due to the over population problem of stray animals in the local area. She said she would like to see Ohio adopt strict spay and neuter laws as in other states. It is imperative that cats are spayed and neutered, as they have the propensity to produce four litters per year, according to Counts. Connie Risner, office supervisor of Shawnee Animal Clinic, located at 101 Bierly Road in Portsmouth, said pet owners should make sure their pets receive heart worm treatments, as well as annual examinations and vaccines. Before going out to purchase cat or dog, Counts highly recommends pet seekers make a visit to an animal shelter. For more information visit the website: sierra’shaven.org or call 740-353-5100.